Lenovo delivers a contemporary and sleek design monitor for those who do business. The Lenovo monitors support higher productivity and efficiency with essential usability and energy-saving features for entrepreneurs running small and medium businesses. The 20" WLED panel with 1600x 900 resolution provides a crystal-clear display. 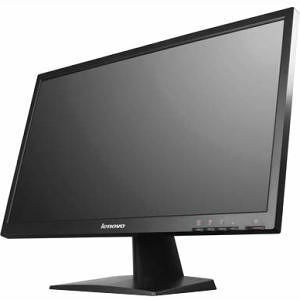 The Lenovo LS2023 Wide is packed with green features including being mercury-free by adopting white LED backlights, arsenic-free glass, and meeting the latest Energy-Star 5.1 standard and being TCO Displays 6.0 compliant and EPEAT Gold. The Lenovo LS2023 Wide is able to mount the optional sound bar as accessory.- 20inch viewable size (442.88×249.12 mm) - Native resolution of 1600 x 900 - White LED backlights - Aspect ratio: 16:9 - Pixel Pitch: 0.276mmx0.276mm - Brightness: 250 cd/m2 (typical) - Color Gamut 72% - Contrast ratio: 1000:1 (typical) - View angles(Horizontal/Vertical, @CR=10:1): 170 degrees / 160 degrees - Respond time: 5ms (on/off, typical) - Internal Power supply - Power consumption (typical/max): 19w/22w - Tilt stand for viewing comfort - Direct access button for automatic image setup - allows quick and easy monitor setup - Compliance with ENERGY STAR 5.1 requirements - EPEAT Gold - Kensington Lock slot for security - TCO Displays 6.0 compliance - Meets 100mm VESA standard(1) for mounting - Capability to mount the optional sound bar as accessory - Certified for Microsoft Windows 7/Windows 8.